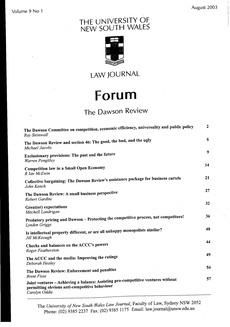 eCite - Predatory pricing and Dawson - Protecting the competitive process, not competitors! Predatory pricing and Dawson - Protecting the competitive process, not competitors! The question is relatively simple to state: under what circumstances, and to what extent, can a corporation with substantial market power engage in vigorous price-cutting? Pricing is predatory where a corporation sells at unsustainably low prices in an attempt to drive competitors from the market. However, predatory pricing may be difficult to distinguish from legitimate pro competitive conduct, such as vigorous discounting. Vigorous competition is desirable because it is likely to deliver economically efficient outcomes.